I had snagged this tissue-thin unstable rayon-lycra jersey on a broken plastic piece of my sewing table insert while hemming, opening up a hole right over the bust area. I was not about to scrap this thing, given how hard it had been to cut out (like slicing through water, argh! ), so I repaired it with a little hand-stitching, and I hope no one is looking close enough to notice! This breastfeeding hack of my beloved Jalie 2921 scarf-collar jersey top is my fourth piece for the Small Human Being Sew-Along this month with Cindy and Clio. 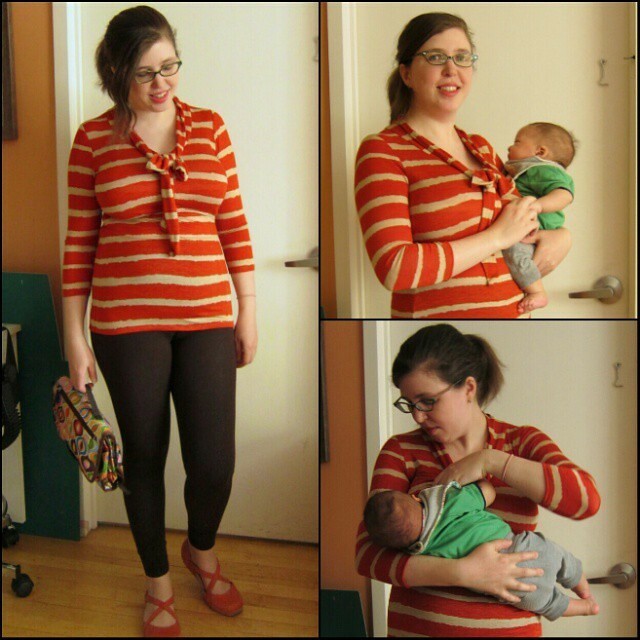 The inspiration: Specialty nursing tops aren't necessary for breastfeeding – but I love them anyway. 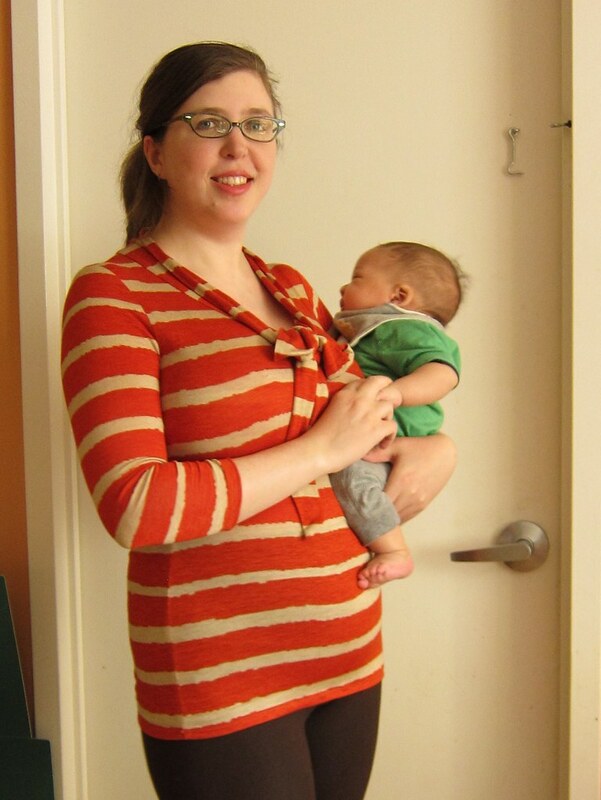 Any top that can be pulled up or down or unbuttoned can work... but I like to be able to get baby his lunch quickly without a cover, and I don't want to show off my belly. So easy access is key, and tops that open right above or right under the bust fit the bill. So I decided to make my own versions in distracting stain-hiding prints. 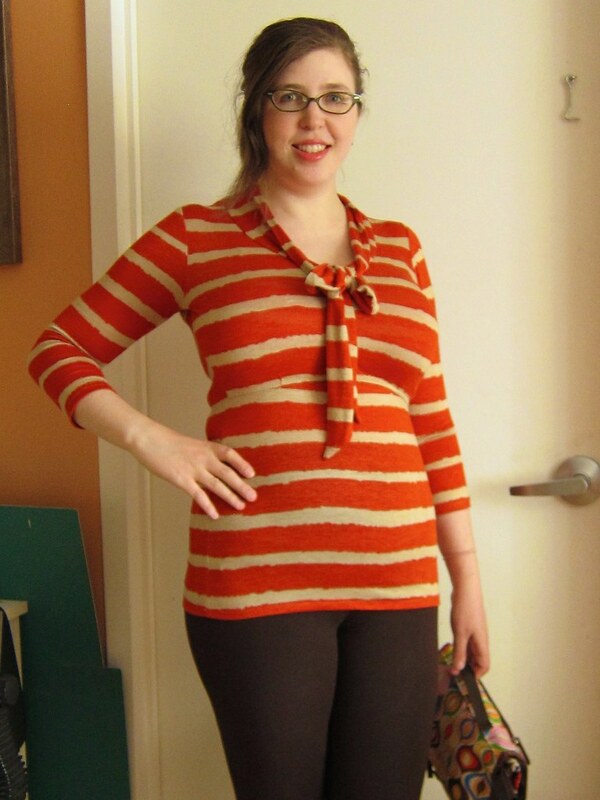 Pattern: Jalie 2921 scarf-collar top (basically a knit version of a bow-neck blouse! 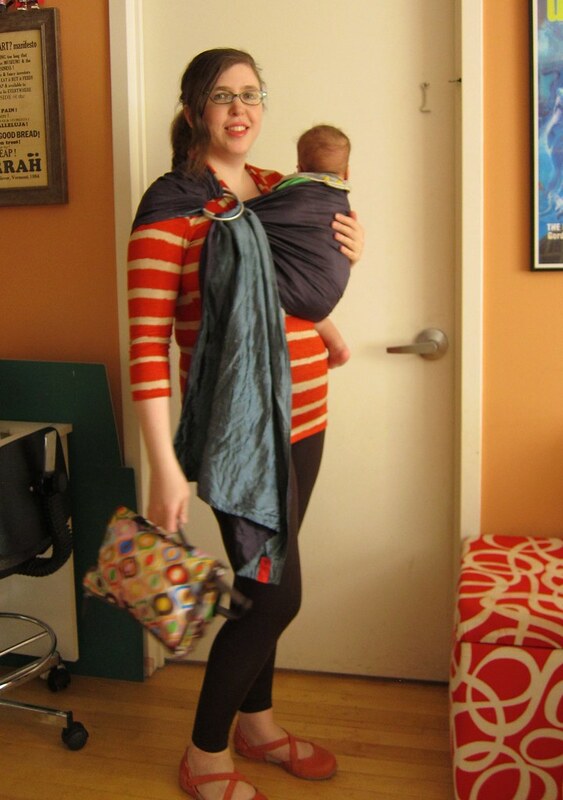 ), hacked with the So Zo nursing top tutorial. I'd previously made this fantastic top pattern (not hacked for nursing) in a floral and polka-dot version, both of which I wear, and get complimented on, constantly, so it is a real TNT. 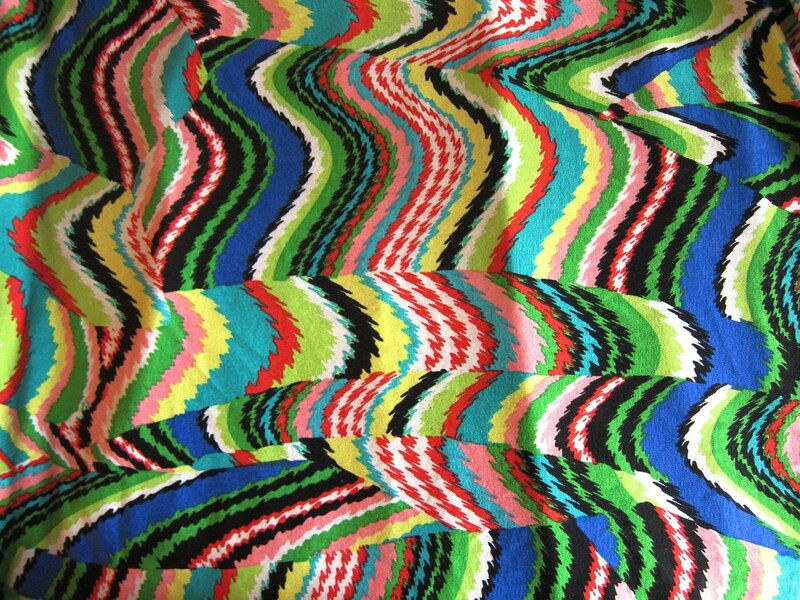 Fabric: Slippery thin striped (rayon lycra?) jersey knit with good recovery that I got for free in a fabric swap. Horribly thin and unstable while cutting and sewing (I was swearing a LOT while cutting) so I can see why its former owner ditched it. Size: Because I still seem to be shrinking slowly post-birth and this fabric is super stretchy, I decided to stick with my usual size even though my bust, waist and hips are all 3" bigger than last time I made this thing. Which is a size S (34" bust) overall, but a size V (37") for the bust and front sleeve armhole. My actual bust is 41.5" right now, so there's a lot of negative ease going on here. Notions: 1/4" clear elastic for the bottom of the overlap and the top of the underlap. But I think next time I will use a heftier knit elastic, the clear stuff seems too flimsy to me for frequent nursing. So it's maybe slightly TOO thin and clingy, but I think it will loosen up over time, and I personally rather a top be slightly too tight than too loose. Instructions: Zoe's free tutorial was clear and thorough, and I found it easy to apply to this pattern I had already made several times. I did cheat a bit by just adding marks to my existing traced front pattern piece rather than creating new pattern pieces for the overlap and underlap, and it worked out fine. Modifications: In her tutorial Zoe recommends the overlap ending 3/4 down the bust instead of under the bust, but I personally prefer the underbust line, so I moved it down. And the overlap front piece is split down the middle, but I made the underlap a single piece cut on the fold. Construction notes: I made this all on the sewing machine with a zig-zag stitch, as I was visiting my mom and she doesn't have a serger. The fabric was so thin that it practically seemed to tear apart as I stitched, so I hope it holds up over time. How I found the time: I was visiting my parents when I cut and sewed most of this, and they held the little guy quite a bit while he was awake. 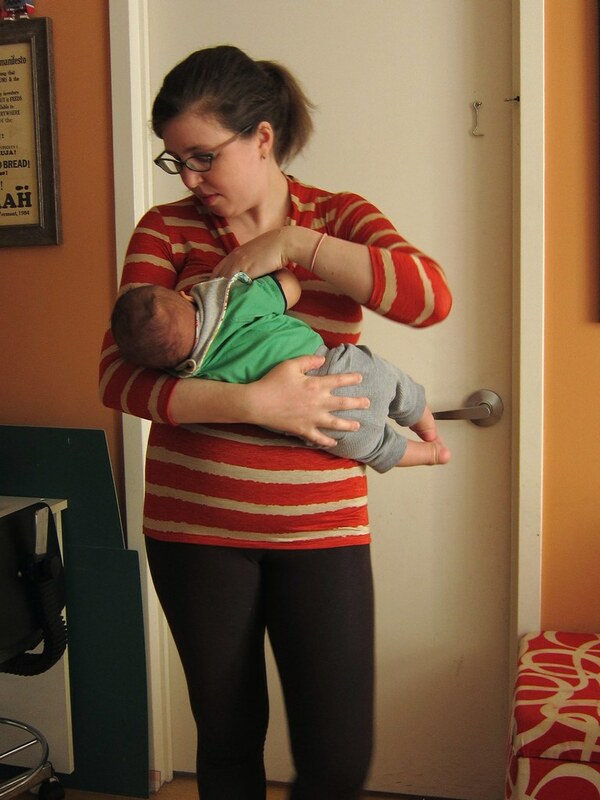 I finished it when we returned to Brooklyn in very small chunks during baby's way-too-short naps. 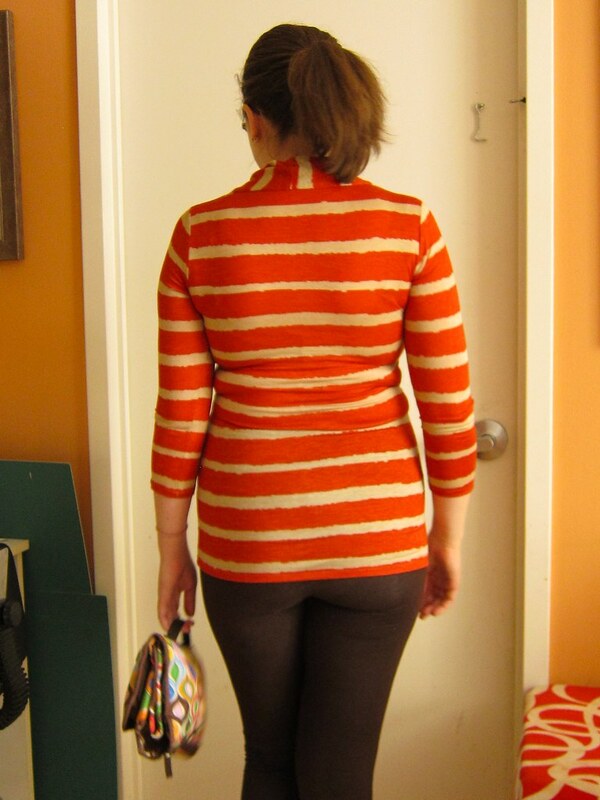 Leggings: Yummie Tummie by Heather Thomson compact shapewear leggings (scored on eBay for $3.50 due to a tiny flaw). Diaper clutch: Skip Hop Pronto diaper changing clutch/station in a Jonathan Adler print, also scored on eBay. Orange flats: Ahnu Karma ballet flats in Red Clay, bought on deep sale at Amazon. Ring sling: Sakura Bloom essential double-layered dupioni silk ring sling, can't remember the colorway as I bought it in 2010. By the way, I do realize leggings are not actually trousers/pants/jeans. But since I don't have a single pair of non-maternity jeans that fit at the moment, I hope you'll forgive me. And these Yummie Tummie high-waisted tummy-control leggings are pretty amazing — thick and supportive and comfortable, and I immediately had people telling me "wow, you look great, getting in shape!" etc, even though my actual size and weight have not changed in over six weeks. Oooh, I can't wait to see how it turns out. I forgot to mention that Jalie actually has some dedicated nursing patterns (I'm just trying to avoid buying new patterns at the moment given how many I already have). I think you and your new top look GREAT! You'd never guess there was nursing access in this top. Really, really well done! And I used to be high and mighty about leggings not being pants, but then I had kids and decided that there are days that a dang old stretchy pant is a way more practical/comfortable option, so I wear them anyway! As long as they're not sheer and you style them well as you have, I say go for it! Thanks! I know this is your TNT top too. I think the stripes distract from the nursing access. Certainly that Mood knit is going to be about as hypnotic/camouflaged as possible. And might hypnotise el Baberino. No leakage/stainage for you! That top is fantastic (and I love the matching shoes). 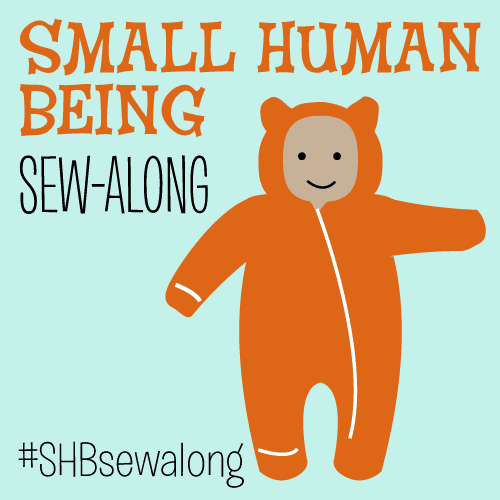 Kudos to you for finding time to sew with a little one and a baby. You should see the state of my apartment, that was the only way I found the time... I had to crop these photos really carefully and even so you can really see the mess! You can't see the repairs at all, so I hope it holds up! Looks great. Looks great! I'm going to have to make one (or many) tops like that. I love the fabric and the fit is very flattering on you. Hopefully, it will hold up for a while. Great hack!!! I can't wait to see it in that crazzzzzzzy Mood print. That is going to be .... dazzling! dizzying! awesome!!! And yay for comfy stretchy pants that get you compliments! Lookin' good, mama.